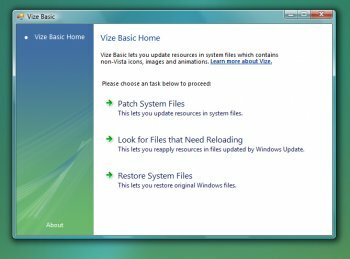 Vize is a GUI enhancer for Windows Vista. It replaces most of the non-Vista icons, animations and bitmaps that Microsoft is still overlooking. It automates the process of replacing resources in system files, applying the real fit and finish to Windows Vista. The patching process will not disable Vista's built-in security features. Vize will automatically restore all files and folder permissions, making your Vista experience nicer without sacrificing security. If you are not satisfied with the results, you can completely uninstall Vize. robmanic44 said "It will wipe Stardock desktops from your system." That may be the only benefit I could possibly see about this program. I tried this on a standard vista install and it was ok... nothing really outstanding with it. But since I have Vista SP1 RC1 on my computer now I won't install it. Don't use this if you are using Stardock. It will wipe Stardock desktops from your system. The program isn't dangerous, but it destabilizes systems for sure...not by itself, but in contact with certain other applications. I'll explain - I used to use XPize religiously. At one point I had a virus scare (false positive) and ran one of those Symantec Check and Remove files from their site - after that was run, many hidden files showed up (mostly .ini) and couldn't be hidden again. I deleted a few (desktop.ini) since I knew XP would just recreate them....and that worked. Anyhow, checking hidden in the boxes didn't work for the exposed files, neither did flipping the show hidden, hide system files in the options. In addition to this, I could no longer run apps from the run menu or under command, I'd have to type out their paths fully under command. This was the truly annoying effect. After extensively narrowing down the files on my home machines I realized it was XPize, as 2 machines in my home are identical apart from XPize and Winamp which run only on my PC. I ran the symantec utility on other machines and it didn't do the same thing. To make this 100% for myself, I simulated my XP install in VirtualBox and recreated the issue, since then I have not messed around with programs that patch system files. The problem isn't necessarily XPize or Vize, it's other software that use specific methods to uproot viruses/malware. atleast i can install it but what is difference ?? i cant see any changes ? So long as nothing goes wrong during/after the install, and resources within *.exe & *.dll files are replaced and not the files themselves, I suppose it could be cool - I've used the XP product XPize with no trouble. I've also manually done that with several of my own system files with ResHacker to make my Vista wanna-be theme on XP a bit more complete, with no ill effects. Windows Update will occasionally replace an edited file when said file is part of an update, making it necessary to re-apply changes from time to time. If, however, such editing changes file size and checksum values of the system file(s), I can also see it given users problems. NOT recommended for someone who doesn't know how backup and undo what may go wrong! This is an excellent way to destabilize your system. Again, it does *not* replace system files. It replaces the *graphic resources* embedded in them. The files themselves are left untouched and perfectly functional. It looks kinda pretty, but replacing such interdependent components seems like a REAL gamble if long-term stability is a major concern. Be very, very careful about stuff like this. Replacing Windows system files with "newer versions" that Microsoft has supposedly "overlooked" can lead to version conflict hell. To me, it's just not worth it. I don't see any significant UI enhancements. 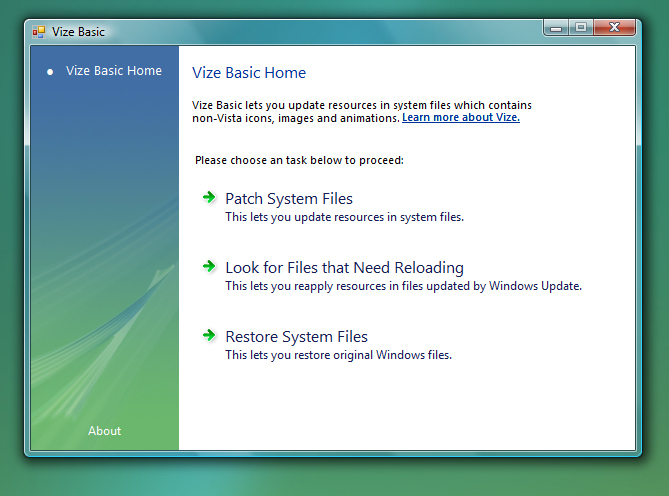 It looks like Vista already includes most of the UI improvements found in XPize for Windows XP. Um, like Vista needs it's GUI enhanced. At 15Mb, I'll pass thanks. Came up with a few errors while trying to restore the system files. Took a couple reboots and running the restore feature several times to fix. Now that it is off... a big sigh of relief that it didn't hurt anything. XPize is one of the first things I install on a new XP installation. Hopefully Vize will become as essential, but it'll be a while before this is as mature as XPize. The program UI is much improved, and the few changes Vise makes at this stage help to correct what Microsoft overlooked.